The ideal output would have PolicyNumber as the header and then a policy number on the line below and if I ran the test again it would put the next policy number on the line below the first one. I think your problem is caused by the fact that WriteLine writes specified string with "CR LF" characters at the end of entered string. This is expect behavior of writing line If I run your CreateCSVFile sample multiple times, it correctly saves the csv file with empty line only at the end of file, not between the lines as in your example? So the question is, how exactly do you call the WriteLine in your code? Could you please post the entire solution/sample project? Thanks for your reply, I will compile a project and get it over to you on Monday. Hi, apologies for the slightly late reply, I have compiled a project with my set up that I'm using, I've also attached the output file that is generated by our program, I've cut it down so it just has the policy number. If you need the location on the computer where this goes it is C:\Users\[username]\AppData\Local\Temp. As seen in the screenshot each one of these test cases contains the create, data mine and set data source files. What I would like it to do would be create the initial CSV file at the start of the main test case with a header saying 'policy number'. 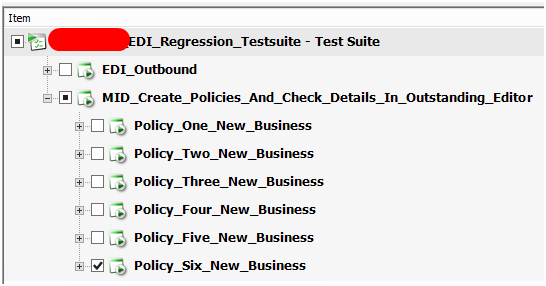 When the first policy is created it should add the policy number to the CSV file on a new line below the header. When the second policy is created it should add the second policy number on a line below the first policy number. It should do this for all six policies created so by the end we should have a CSV file with 6 policy numbers underneath the policy number header. Unfortunately, I was not able to reproduce the issue on my machine with the attached solution. If the following call of the WriteLine()-method is disabled within 'CreateCSVFile.cs', no empty line is added between the values. Could you try again running your code without calling the additional WriteLine()-method? I have removed the blank writeline and when I try to generate the csv it has the PolicyNumber header and just a blank line beneath it that hasn't been populated? If the issue isn't solved by now, please contact [email protected]. We'd be happy to assist you in this matter.